I must admit, leading up to our wedding, planning occupied most of my time and I put several DIY projects on hold. Now that the wedding has been perfectly squared away, I’m totally ready to get back on track with the list of home decor projects on my list! I’m thrilled to share with you that I’ve been invited by BEHR to join an elite team of 18 other BEHR DIY Experts! What does this mean? Means I’ll be sharing monthly DIY paint projects, inspirations, and latest paint trends sure to get you geared up for your own paint and home renovation plans. Feel free to suggest some future paint projects for me, I’d love to work on a few that you’d like to see! In the mean time, here is a glimpse of some BEHR paint projects I hope to work on! We painted our house shortly after we moved in, hard to believe its been nearly two years! We refreshed with a few coats of paints, sticking to soft solid colours, such as whites and greys. Now that we’ve had some time to settle in, I’m ready to add some bold statements. 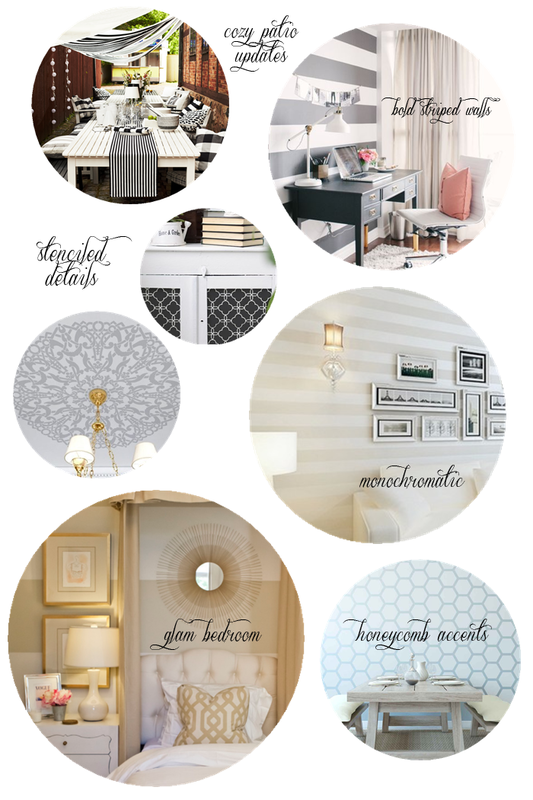 Stripes and stencil patterns are high on my list. I’m also hoping to transform our master suite outdoor deck into a cozy oasis. Right now, it’s occupied by weathered patio furniture and scrap pieces of wood. Can’t wait to share more with you! Be sure to follow along all other fellow BEHR DIY Experts for more inspiration and projects! Yay! Glad to be an “expert” with you. Look forward to your projects! Stencils and patterns! Can’t wait to check out your projects! Thanks Kim!!! Can’t wait to work on them!!! I’m loving the inspiration photos and can’t wait to see what you create!